-Nigella's Super Juicy Spiced Turkey, from Feast. I bought my frozen turkey, which was about nine pounds, on Thursday. I thawed it until Saturday morning, when I put it into a spicy brine overnight. On Sunday morning (right - I had Thanksgiving dinner on Sunday night.) I took it out, dried it off.. gave it a glaze, and into the oven it went. Perfect, except that it got a little bit burned at the top. I'll put it lower from the beginning next time. And yes, there will be a next time. -Cornbread stuffing with orange and cranberries, also from Feast. Minus the cranberries though. I wasn't superimpressed with this - I much preferred the cornbread in its unadultered form (and that was so fabulous it'll have to be a post of its own) and I'll probably skip it next time. But it was good, and everyone liked it. -Green bean and lemon casserole, again, from Feast. This was not bad at all - but very basic. Nice to have a veggie dish though. I cut down on the butter in the recipe, and it was just fine. 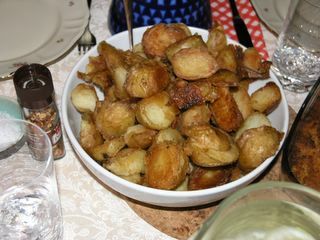 -Roast potatoes - yum. I always have great success with this, so no big surprise here. I used soft potatoes, parboiled them, shook them around quite a bit, put them in a tray with some oil, lots of salt and.. that's it really. Into the oven, leave them for a long time. Yum. -Sweet potatoes and marshmallows. 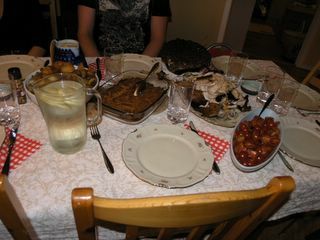 From Feast. Won't do this again. Nice, but definitely not spectacular, and the marshmallows expanded. Like, a lot. Like, to fill my oven. Or it felt that way. And what on earth to do with all the leftovers? No, this was too weird. -Cornbread. Perfect. More on that later. -Marinated cherry tomatoes. I didn't want a full-on salad, but just a little something. 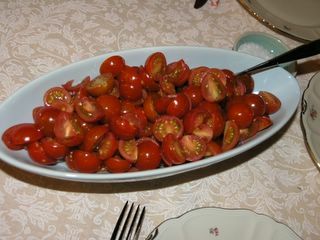 I halved cherry tomatoes, drizzled with a raspberry balsamic vinegar, some salt and a pinch of sugar. Excellent! -Cream sauce. Ready-made, I didn't have the energy to make it from scratch. -Cranberry sauce. Made from scratch. No huge hit with the family. Nice, but unnecessary. And that was it. I finished the meal with a frozen cheesecake, a family favorite but with a holidaý twist. Use a springform pan. Grease it with butter, and line it with gingersnap crumbs that you grind finely in a pestle. This is your crust. Make sure to line the sides of the pan, too. Cream the cheese, egg yolks and the sugar. Flavor with the vanilla, cinnamon, lingonberries and apple butter. (Or for another flavor - omit all these, and flavor with lemon peel.) Beat the cream until it forms stiff peaks. Carefully blend with the cheese cream. Beat the eggwhites until stiff, and fold those in too. Put in the freezer for at least six hours or overnight. Take out about twenty minutes before you want to eat.